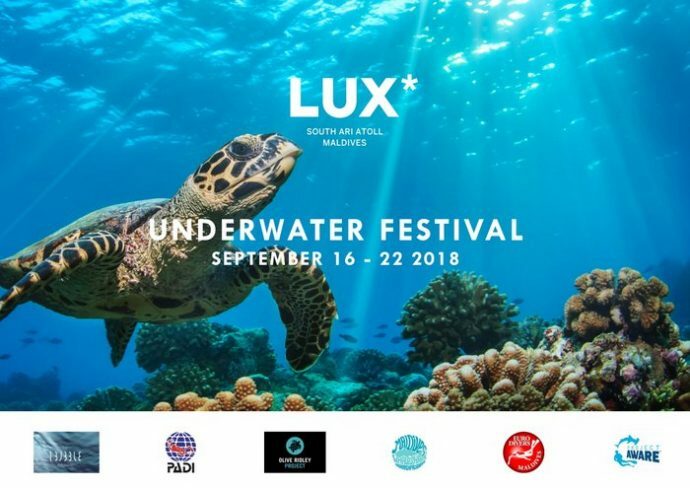 LUX* South Ari Atoll has announced plans to host an underwater festival in September. The festival, conducted in partnership with Euro-Divers Maldives and the founder of Project AWARE and PADI Dive Legend Dr Drew Richardson, will take place from September 16-22, with each day offering a full immersion into hands-on conservation courses and exciting dives and excursions with specialist marine biologists as well as experts in underwater scooter and drone photography. “Join LUX* for a one-of a kind experience to dive deep into the world of marine conservation and to witness some of the worlds most magnificent creatures living in the iconic crystal waters of the Maldives,” an announcement by the resort read. The festival allows guests to take part in a full week of exciting underwater exploration and conservation workshops with leading conservation legend Dr Richardson, and learn all about whale sharks with English marine biologist Mark McMillan. Leading veterinarian and biologist Dr Claire Petros will also host a sea turtle presentation along with a group snorkelling excursion. Accompanied by underwater drone expert Benjamin Valtin, guests can also learn all about iBUBBLE, the first autonomous diving drone, and receive their own personal video footage of their diving experience in the iconic waters of the Maldives. Matt Wenger, the Regional Manager for PADI Europe, Maldives, Middle East and Africa, will offer underwater exploration with fast and fun underwater scooters, while PADI dive underwater camera or DUP experts are set to help guests in their photography techniques to help with tips and tricks on how to get the best angle, lighting and the science of getting good photos. Meanwhile, Richard Somerset and Mark Spiers from PADI UK will conduct scuba dive and open water dive courses. Joining the international experts at the festival is talented Maldivian artist Hussein ‘Iphpha’ Iffal, who will showcase his talented underwater painting skills for everyone to enjoy at LUX* South Ari Atoll. Guests can snorkel alongside or watch from the arrival jetty as he creates his masterpiece underwater.